Checked out. That's how you could describe your new team. Here you are, in another meeting with the right people, at the right place, at the right time, and yet . . . when you look around the room, it's a sea of blank, disengaged stares. This isn't a team, you think. But maybe, this time, it will be different. Teams take the ingredients available to them and transform them into exceptional outcomes. They craft software applications, from early ideas to compiled software. They create plans for social services and urban centers and Michelin-starred meals and bring them to life. These teams bring the best effort of each individual into their collective work. They debate and align on critical decisions, pursuing a common purpose. They solve problems for the benefit of others and take ownership of what they produce. Most important, they thrive under a shared vision of success. When we put it that way, don't you want to be on a team, all of the time? Sure you do! Except that teams are made up of people. And people are messy and complicated, even when they're trying to be logical about making decisions and solving problems. They—we, you, all of us—confound each other, even on the best of days. This is the central contradiction of work: team ideals versus people reality. We're thrown into a room with a bunch of strangers and asked to do the seemingly impossible. And to manage the impossible, we need a way to get things done with some semblance of order. We never have enough time to do any of this, and sometimes we make distressing compromises to deliver. All to sell and ship and innovate and save lives and change the world. Today's teams strive to serve their customers with the highest-quality products, services, and experiences they can create. And while their attention is focused on creating great project outcomes, we've seen that the quality of teams' experiences—how they work together—often falls by the wayside. Even worse, organizations are putting less care into sustaining and retaining teams over time. The dominant, unspoken assumption is that people will be at their jobs for only a few years, so there's little motivation to create the right conditions for teams to flourish. Many organizations struggle to define how their employees will be successful at teamwork over the long-term. No one picks up a book on teams or management, or really anything in the business section, because things are going well. You know things could be better. Everything's pretty top-notch, thanks is probably not what you were thinking when you opened this book. 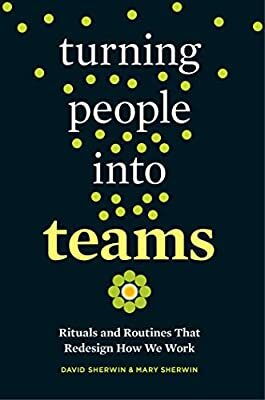 Turning People into Teams is about how teams can choose to work better together. We've found that short, focused rituals can greatly improve day-to-day working environments, and this book shows you how to do these rituals with your team.